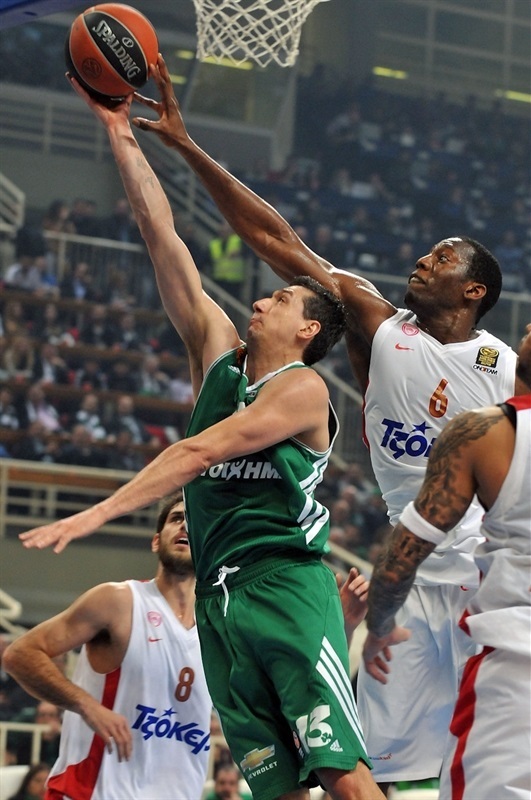 Greens hold on to stop Olympiacos, 66-62, in a thriller! In a derby battle that neither team led by more than 4 points at any moment of the the game, Panathinaikos Athens held on to stop archrival Olympiacos Piraeus 66-62 to tie them both for second place in Group E. Both teams have 4-3 records at the halfway point in the Top 16, the same as EA7 Emporio Armani Milan, all of them now three victories behind undefeated group leader Barcelona. The last of the game's 13 ties and 14 lead changes came at 62-61 on a free throw by Dimitris Diamantidis with 46 seconds left. 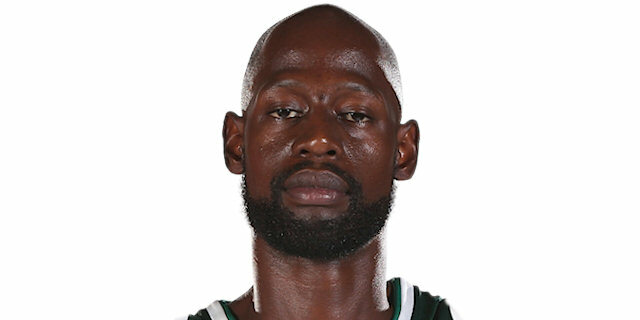 After that, he, James Gist and Stephane Lasme hit 4 of 6 more tries at the line while the Panathinaikos defense shut down Olympiacos the rest of the way. Lasme led the winners with 18 points and added the game's key defensive play, a big block in the next-to-last minute. 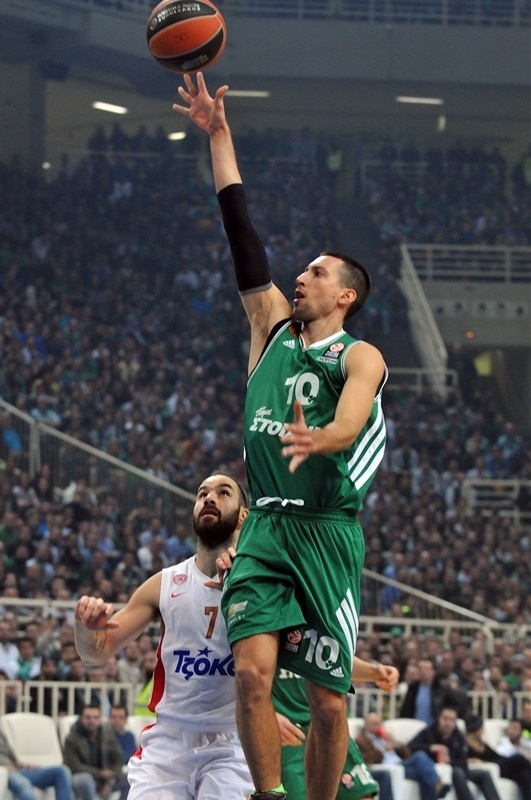 Roko Ukic added 14 points while Diamantidis had 9 and 8 assists for the Greens. 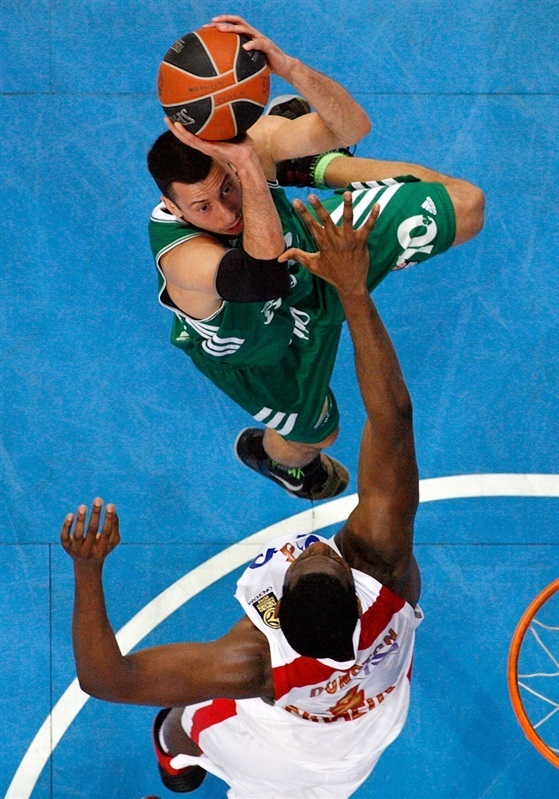 Stratos Perperoglou had 12 points, but only 1 after the first shot of the second quarter, to lead Olympiacos. 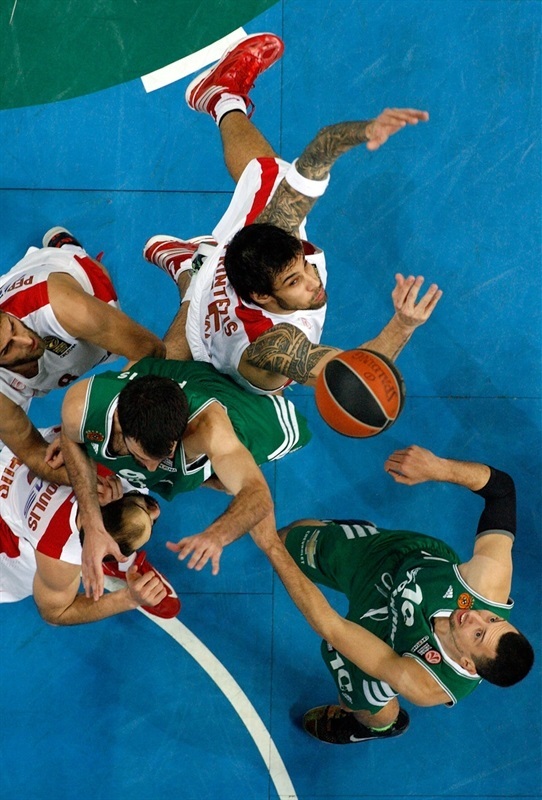 Georgios Printezis was the other double-figure scorer for the Reds, with 10 points, while Vassilis Spanoulis was held to 6 on 1-for-9 three-point shooting and 0 assists. Olympiacos went inside to Bryant Dunston for an easy layup to start the scoreboard, while Daimantidis did the same by assisting Lasme for their team's first basket. Evangelos Mantzaris soon buried an open corner triple for the Reds, but was answered from the arc by Diamantidis for a 5-5 tie. Perperoglou put in two post-up hook shots around a jumper by Gist before Ukic hit a three-pointer for the first Panathinaikos lead, 10-9. That didn't last, however, as Printezis scored inside twice in a row, the second time on a halfcourt fastbreak pass from Mantzaris for a 10-13 advantage. After a Panathinaikos timeout, Ukic hit a step-back shot on the run and Diamantidis buried free throws to get Panathinaikos back in front. When Michael Bramos came on and buried wing triple, the Greens were up 17-13. 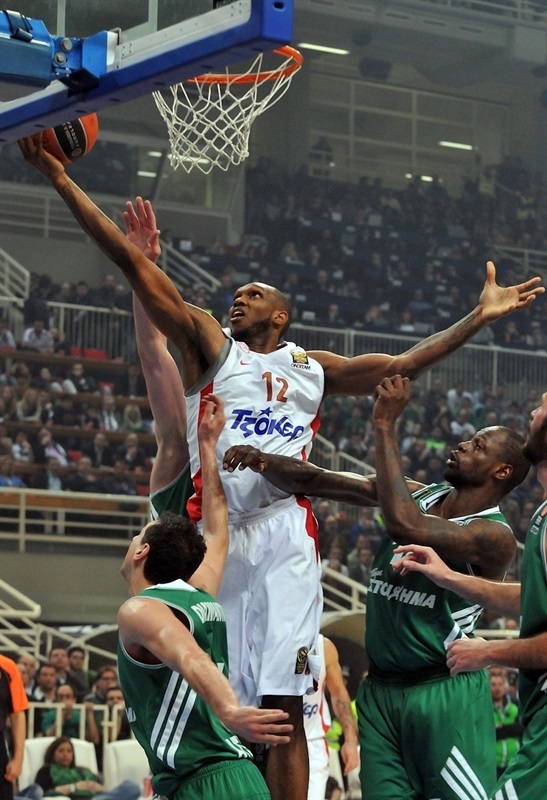 Olympiacos went back to Perperoglou in the post to end the Greens' 7-0 run, but Ramel Curry matched him with a jump shot. 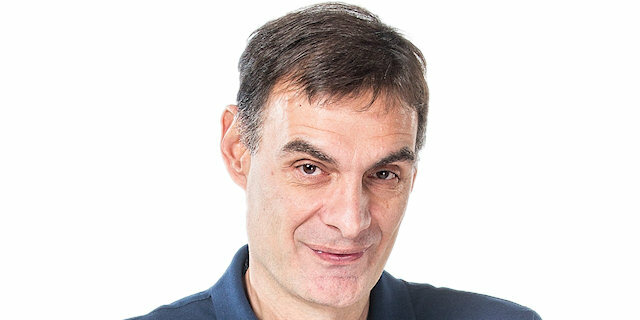 Perperoglou had the final chance of the quarter and made sure of it with his first three-pointer to cut the deficit to the minimum, 19-18, after 10 minutes. Perperoglou picked up where he left off, with his third turnaround jumper from the baseline to give Olympiacos the lead back, 19-20, to open the second quarter. Curry answered for the Greens, but Dimitris Katsivelis stepped on court to drop a triple for the Reds. Ukic stepped up with a floater in the lane for a 23-23 tie, which Lasme eventually broke in favor of Panathinaikos with a jumper from the circle. Ukic upped lead to 27-23 with a layup as the Greens kept finding points inside. After a timeout, Matt Lojeski made his first shot attempt for the Reds, as did Mirza Begic, fresh off the bench, to forge another tie, 27-27. Lojeski hit a huge triple on the wing before Kostas Sloukas beat the shot clock with a long two-pointer as the scoreboard swung in the Reds' favor, 27-31. Loukas Mavrokefalidis ended the Reds' 0-8 run with an acrobatic shot, Diamantidis followed with a reverse and Gist took the lead back for Panathinaikos, 33-31, on a drop shot in close. 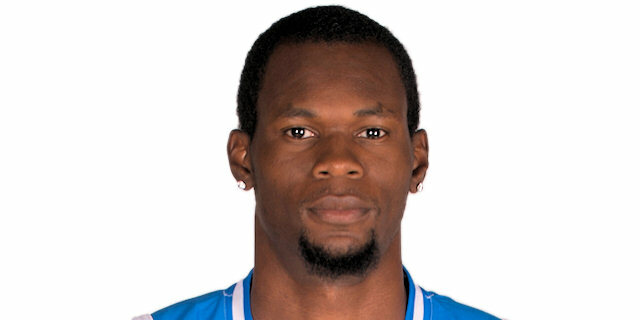 Brent Petway getting called for an unsportsmanlike foul let Lasme raise the difference to 35-31 with free throws before Printezis ended the 8-0 run of Panathinaikos by flipping in a left hook. Olympiacos had the ball with 4.3 seconds left and a chance to tie, but still-scoreless Spanoulis missed a long three-point try to leave Panathinaikos in front, 35-33, at the break. Lasme tipped in an alley-oop pass to open the second half, but in one play - sinking both a triple from the wing and the free throw that came with it - Printezis tied it up, 37-37, for Olympiacos. The Reds went ahead on a tip-in by Cedric Simmons. Jonas Maciulis made his first basket for yet another tie, 39-39. Ukic reappared in the corner and did the honors of putting Panathiakos up with a smooth three-pointer, 42-39. Out of a timeout, Olympiacos took its turn going ahead as Spanoulis hit 1 of 2 free throws and Evangelos Mantzaris a three-pointer to make it 42-43. When Spanoulis bounced off Gist and hit a layup, his first basket of the game, the Reds were up 42-45, but Antonis Fotsis stepped outside and knotted the score again with one shot from the arc for the Greens. Lasme would take the lead back on free throws for Panathinaikos, but Mardy Collins beat the third-quarter buzzer with a great layup to even the score yet again, 47-47, after 30 minutes. 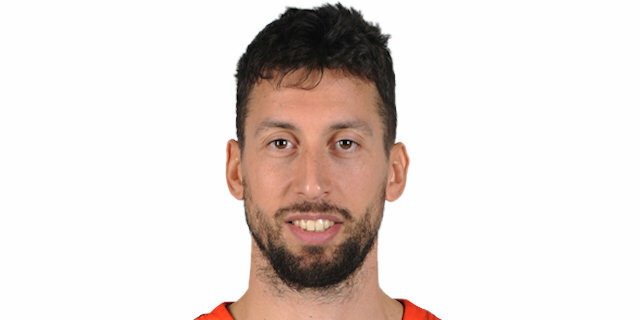 Although closely covered, Spanoulis stepped back for a perfect three-pointer to beat the shot clock and open the final quarter putting Olympiacos ahead. Lasme answered with a nifty baseline finger roll to make it 49-50. Dunston, scoring in close, kept the Reds a step ahead, but then Curry found Gist alone for a super slam. Next, Panathinaikos moved the ball around the perimeter to Bramos in the corner for a game-tying triple at 54-54 that lifted the crowd to its feet. However, after a near Panathinaikos steal at the other end, Lojeski drove hurriedly from beyond half court to slam on the shot-clock buzzer and put Olympiacos up again. Next to beat the shot clock was Sloukas, firing in a quick-strike triple at 55-59 with 4 minutes left. Lasme calmed the Greens with a hard-won hook shot at 57-59. After a timeout, Ukic got loose in the lane for a game-tying one-hander but the Greens left Dunston loose for an easy dunk to make it 59-61 with 2 minutes left. 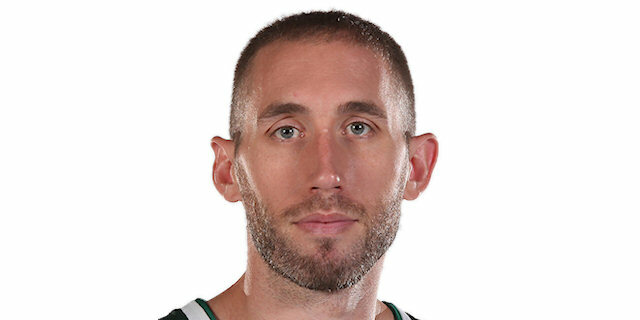 Lasme forged another tie with a shot in close and then blocked a layup try by Sloukas, letting Diamantidis get to the line to put Panathinaikos up 62-61 by making the second of his pair of free throws with 46.8 seconds left. 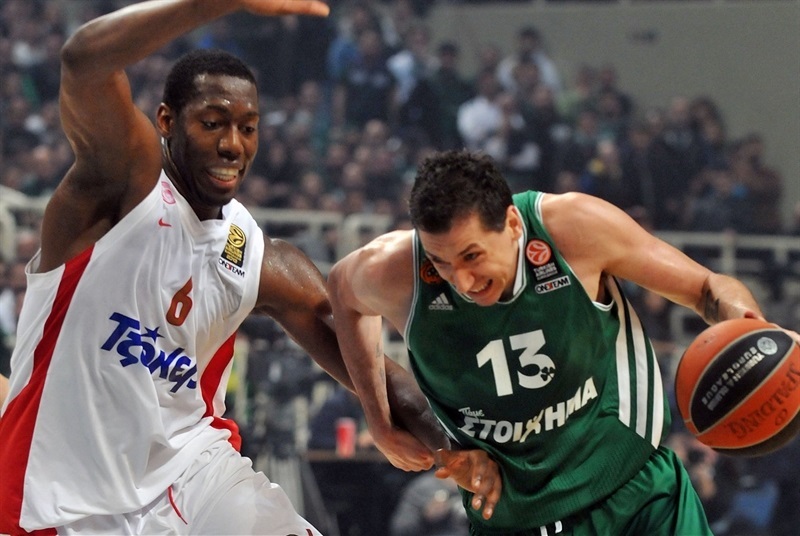 Spanoulis missed a long three-pointer with 21.4 seconds left and Gist was fouled, making 1 of 2 for a 63-61 Panathinaikos edge. After a couple of timeouts, Lojeski ran the clock down but missed wtih 3.4 seconds left as Diamantidis grabbed the rebound and was fouled. He made his first free throw, missed the second, and fouled Perperoglou, who made the second of his pair with 2.1 seconds left at 64-62. 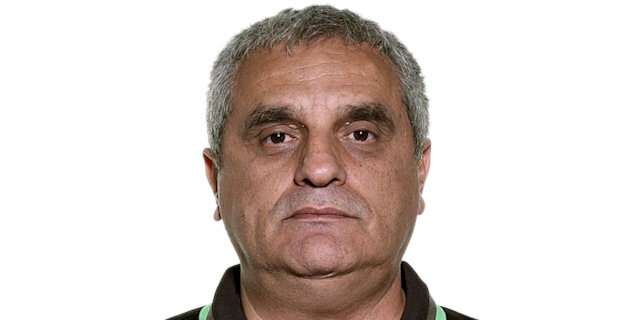 Panathinaikos lobbed the inbounds pass to Lasme and he made 2 free throws to end his team's three-game losing streak and match their archrivals in the standings. "We played a difficult game against a fresher team and the proof of that is that they dominated under the boards. We used our weapon, which is the team-based defense and played smart at the end to win it. I want to make clear that we don't call our defense a mind game and we respect all opponents. Since last summer Ukic is climbing a Golgotha due to his injury, but we are here to support him and give him credit for his effort. He is unable to make several moves, such as running and jumping, but he plays a great mental game. Our success in the games versus Olympiacos is that we don't allow them to keep them in low scores. We have analyzed all the plays they run for Spanoulis, but it is not simple to stop him, otherwise every team would have done it. I want to thank our fans for their support and the good atmosphere." "It was exactly the type of game we were expecting. 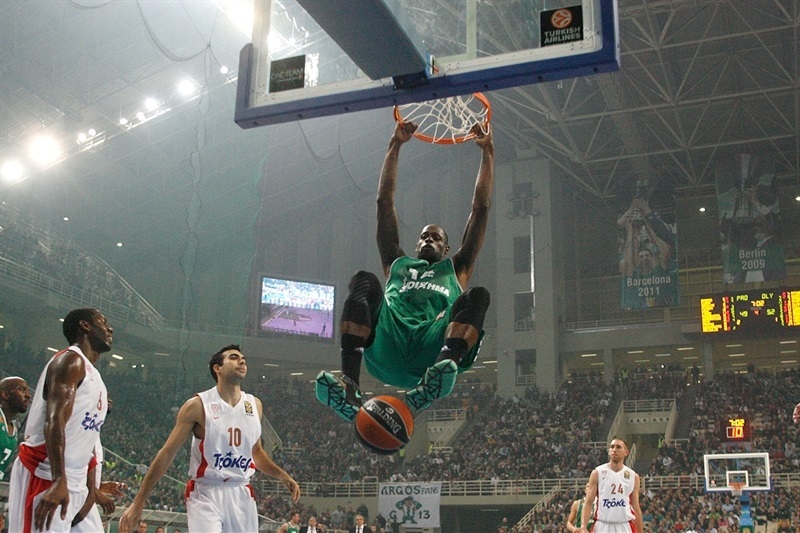 We managed to control the rhythm, thanks to our god job rebounding, but we didn't put more pressure on Panathinaikos. Finally the game was decided by one decision, one mistake. There are two more months in the Top 16 and we have to forget what happened tonight. We had a plan, but when a game comes to such an end, the players use their instinct. 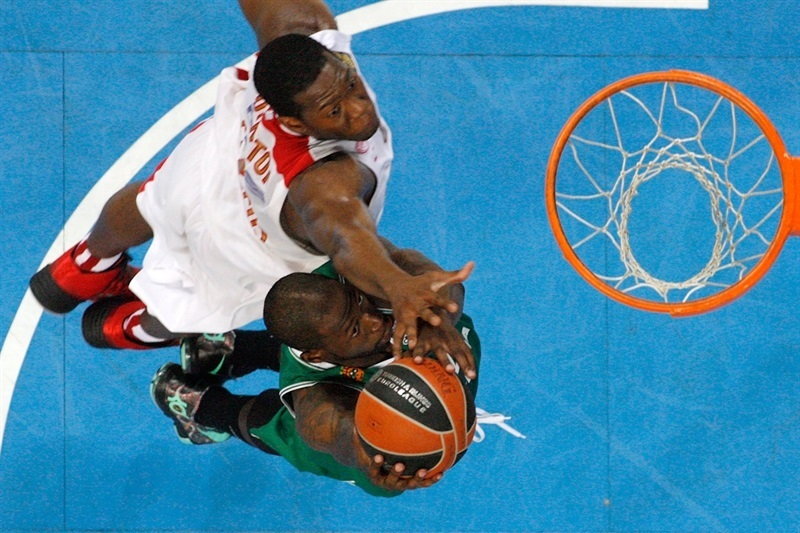 Panathinaikos is used to playing a style, by going to the offensive boards and executing in 20 seconds. It is not easy to play against them and score 85 points. Unicaja Malaga did it last week, thanks to many three pointers, but this is something impossible at OAKA. I have no reasons to complain to my players. They are stressed, but this is our job. " "The result means a lot for us. The victory keeps us alive, because in case of a loss we would have had many problems. Now the situation is neither great, nor bad. As usual, it was a very closed and competitive game, which was decided by the details. At the end, we had something more and beat them." "It is a big win after three consecutive losses and it helps us to recover and look forward. In such a great game, the heart and the energy usually become the most decisive factors and count more than the tactics. The fans pushed us to overcome the difficult situations and I felt it personally, since I was injured and it was tough to play. " "We needed two good defenses and one basket at the end to get the victory , but it didn't happen. When we led by 4 points, we missed many consecutive shots and this is the reason we lost that game. We weren't afraid of our opponents tonight and I think that we will overcome this defeat. " "We played good, especially in the first half and we followed our game plan, but it was not enough to get the victory. When we led by 4 points, we should have finished the game, but we didn't and we paid for that mistake. Now it is over and we have to get ready for the next game in Istanbul, versus Fenerbahce Ulker."